1By 1968,1 Portugal had been living for 42 years under authoritarian regimes, for 35 of those years under the Estado Novo regime led by António de Oliveira Salazar, a former law professor at Coimbra University.2 During the 1960s Salazar’s authority was weakened, and in September 1968 he was replaced, ostensibly for health reasons, by Marcelo Caetano. This transition raised expectations for greater freedom in Portuguese society, but these hopes would only to be realised by the revolution of April 1974. Students at Porto, Lisbon and especially Coimbra Universities played a central role in opposing the authoritarian regimes, a role which was triggered as much by domestic political developments (the presidential elections of 1958) as by influences from abroad (the student protests in Paris in May 1968). 2This article will examine the background to the student reform movement, and the contribution made to it by the students of the Escola Superior de Belas Artes do Porto (ESBAP), the leading Arts School in Portugal. Groups from ESBAP supported the Coimbra students’ demands for university autonomy in 1962, and later, from August 1968 onwards, they linked up with faculty and initiated a movement for reform at the Arts school itself. As a result, the architecture department was closed at the end of 1969, to be revived in April 1970 with an experimental apparatus jointly run by lecturers and students. 3In 1958 General Humberto Delgado arrived from Washington, where he was Aeronautic Attaché to the Portuguese Embassy, and immediately became the centre of opposition to the Salazar regime as a candidate for the Presidency of the Republic. His support stretched across the non-Communist opposition, from Socialists to the Republican party, democrats, liberals, monarchists and Catholics. His campaign was organised around the Social-Democrat Directory led by a group of intellectuals and individuals in the liberal professions, especially lawyers such as António Sergio, Jaime Cortesão and Mário Soares. Until then the political police (PIDE) had been able to control social unrest,3 but Delgado’s candidacy caused large-scale demonstrations in Lisbon and Porto in support of social and political reforms. 6Several incidents during the early 1960s also indicate serious unrest within the armed forces: the hijacking of the liner Santa Maria in 1960; the attempted coup by General Botelho Moniz, the Defence Minister, in 1961; and the mutiny at Beja barracks in 1962. Aiming to internationalise the resistance, Captain Henrique Galvão hijacked the transatlantic liner Santa Maria in the Caribbean in 1960 and re-named it Santa Liberdade (Holy Liberty). The aim was to declare Delgado president, but his supporters in the military were disorganised and unable to take advantage of the incident. As a result the ship was captured by the US military in Brazilian waters. The following year Defence Minister Moniz, who opposed the colonial wars, was dismissed by Salazar before he could challenge the president. The Beja mutiny (also connected with supporters of Delgado) was more serious, involving high-up members of the military together with the Communist party, but the attempt came to nothing when the Evora military base remained loyal to the government. 7During the Kennedy administration relations with the United States worsened, to the extent that it became “the most disturbed period of the relationship.”8 The UN Declaration on Granting Independence to Colonial Countries and Peoples (1960), promoting self determination for the colonies, was also supported by Kennedy as a means to improve relations with the Third World. The UN Declaration gave extra support to the nationalist movements in the Portuguese colonies in Africa that were demanding independence. For Salazar, war was now inevitable because for him “the future of the regime became the future of the war.”9 In February 1961 the conflict in Angola began after the MPLA (Popular Movement for the Liberation of Angola) attacked the prison in Luanda. In December the small colony of Goa was taken by Indian forces. Conflicts soon erupted elsewhere - 1963 in Guinea-Bissau, 1964 in Mozambique. This ‘long war’ in the colonies (1961-1974) provided the main cause for social protest in Portugal, which began with a mass demonstration on 1 May 1962 and led to the declaration of Student Day on 24 March 1962 at Lisbon and Coimbra universities. 9In August 1968, following an accident, Salazar handed over power to Marcelo Caetano. Caetano had been preparing for this moment since the beginning of the 1950s, first as President of the Corporative Chamber, then as Minister of the Presidency and finally as rector of the University of Lisbon. Caetano was called “the left-wing of the regime” and appeared to offer hope for change, in line with developments elsewhere such as the Prague Spring and May 1968 in France. However, from 1968-70 Caetano insisted on a policy of “liberalisation but keeping the war”,11 a stance which then degenerated into “keeping the war without liberalising.”12 Caetano was able to do this with the important and opportunistic support of President Nixon and Henry Kissinger, for whom the Portuguese dictatorship “was a Nato ally defending the West and the African flanks”.13 Following widespread fraud in the elections of 1969 the regime once again resorted to authoritarianism, arresting and exiling opponents and closing down trade unions and student associations. Figure 1 The University City and the Associação Académica de Coimbra, 1961. Photo by Horácio Novais. 10Salazar developed the fragile Portuguese economy with a strong “public works programme,” including planning for a New University City for Coimbra University (where he had lectured in law). This new urban space was meant to rejuvenate the old university, founded in the 13th century: “Within the spirit of the Estado Novo, it had to be patriotic rather than international, corporatist rather than liberal, organic rather than democratic.”14 Construction began in 1943 with the demolition of the historic city centre, named Alta de Coimbra, and ended only in 1975 with the completion of the Sciences Faculty building. The plan and architecture, designed by the architect Cottinelli Telmo,15 was inspired by Italian and German fascist styles which best expressed the authoritarian ideology of the Estado Novo. It was against the values represented by this architecture that Coimbra students, followed by those in Lisbon and Porto, triggered the greatest university crisis, on the day of the opening of the Mathematics building on 17 April 1969. 13The pivotal moment came on 25 November 1961, during the so-called ‘Storming of the Bastille’ celebrations of Student Day that had taken place in Coimbra since 1921.23 In 1961 the Associação Académica de Coimbra (AAC),24 under leftist leadership since the previous year, organised a number of debates with students from all over the country to discuss association activity around three causes: association autonomy, university autonomy, and university co-management. 16In 1965 the AAC was closed down, its leaders expelled, and all of its activities halted. Administrative commissions were appointed, and for a time there was calm on the campuses. It was a period of ideological reflection for the opposition, during which a student movement was organised out of the banned Association, and political debate shifted to Repúblicas – all-students lodgings – and to cultural groups in the fields of theatre, cinema and music. 22However, in October 1969 the police retaliated, making mass arrests and sending the most committed students to the colonial war. Students continued a campaign of resistance with demonstrations and strikes in the three university cities in the Spring of 1971, 1972, and 1973. Repression was severe since “the political approach of the student movement was now an irreversible fact,” including the development of revolutionary groups inside the university.39 By 1973 this forced the new education minister, José Veiga Simão, to introduce reforms aimed at “democratic education,” “student participation” and opening up schools and universities to the masses. This went against the grain of the dictatorship’s long-held elitism and the repressive stance of the PIDE. The resulting climate of ambiguity in Portuguese universities that only really passed with the revolution the following year. Figure 2 “A Fuga” (The Flight), Architect-teachers leaving ESBAP. 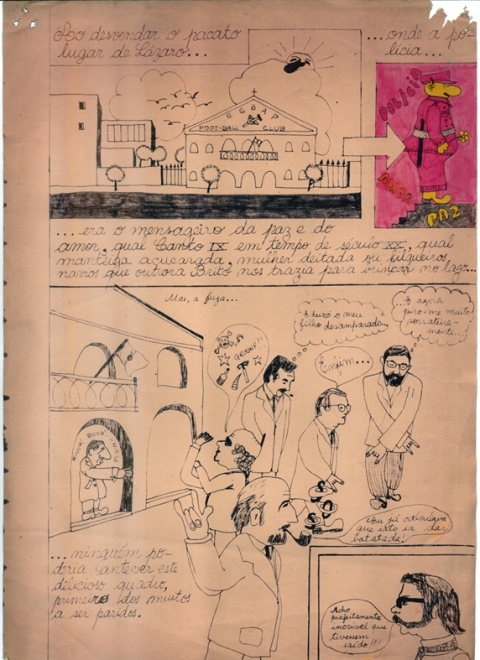 Drawing by the students José Gigante and Francisco Barata, 1969. Archive of Domingos Tavares. 23Probably the most interesting experiment in democratic education during the Estado Novo took place at the ESBAP architecture school. This was only possible due to the relationship between faculty and students carefully built up by the Director, Carlos Ramos. 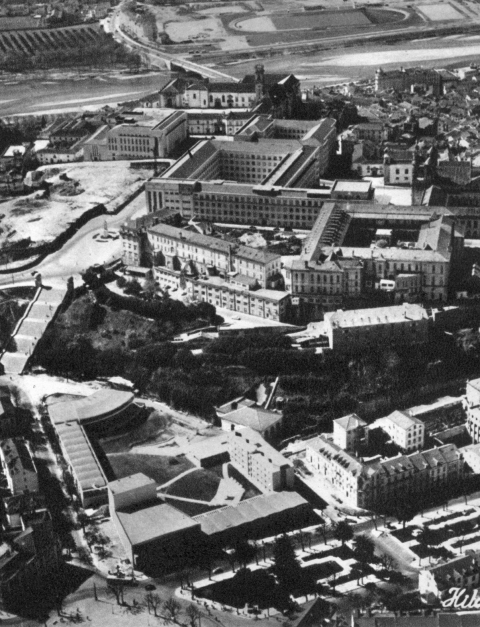 The well-known “Porto School” and its relevance for contemporary architecture is a product of those critical and intense days of the “Experiment”. 25At the Architecture School in Porto, the new curriculum was introduced around three streams with distinct but complementary objectives. The first stream was split into two parts: a central subject – Analytical Architecture – where analytical studies of problematic urban areas were developed through the method of “urban enquiries,” and a focus on science taught at the Science College (which was not popular among the students and caused much resentment). The second stream was strongly based on the practice of architectural design through the subjects of Architectural Composition and Building. This was complemented by a solid theoretical education in Theory and History of Architecture, where the above-mentioned readings of the sociologists about space and society were merged with discussion on Enrico Tedeschi’s Theory of Architecture (1962) and the British ‘New Towns’.43 The third stream’s focus was on issues arising from Urban Planning and the application of different levels of design (from the Urban Project to the Master Plan). 26This approach therefore sought to unite analysis and practicality, science and humanity, art and technique, and architecture and urbanism. It supplied a generation of trainee architects and planners with instruments to intervene in resolving the housing situation through, for example, state programmes such as the SAAL which was introduced immediately after 25 April 1974.44 It also provoked a critical attitude among the student body, many of whom channelled their desire for change into political organisations and related activities such as film-clubs and associations. 27In 1962 students published the first number of the ESBAP bulletin, and it is noteworthy that many were involved in the demonstrations of the Storming of the Bastille (25 November 1961), the First Student National Meeting (9 March 1962), Student Day (24 March 1962), and in solidarity with the ensuing strike of Coimbra students. 31On events in Paris, ESBAP 2 interviewed Carlos Araújo, who described how “in these last few weeks, young people have been demonstrating almost every day, demanding an end to the Vietnam War, political freedom in countries with totalitarian regimes, etc., etc., all of which was supported by the population and without any interference from the police.”57In the university “an obvious fact was the union between teachers and students, since all of them demanded the reform of an education system which was not meeting their legitimate expectations.”58 Students rejected the teaching system, demanding in its place student self-management and “the democratisation of education” and refusing “the life-style” of French society. According to Araújo, the students took the crowds with them, from workers to the common citizen, and French youth as a whole “became aware of its value and claimed its position.”59 ESBAP 2 was probably one of the first student newspapers to discuss the events in France, since censorship restricted the reporting of the mainstream media. 32In late August 1968, heavily influenced by the news from Czechoslovakia concerning the Soviet invasion, the lecturers of the Architecture Course of ESBAP assembled for a political meeting. In a letter to the minister they explained “the discouragement and the exhaustion that have been felt in this school”, including the attending of classes both at the School and at the University, and in the recruiting of lecturers.60 Faculty members asked for a revision of their contracts and the creation of a working group to promote an improved pedagogic approach,61 faced as they were with the imminent “extinction of the School … in a period of a lack of [professional] values and a crisis of conscience, with the resulting national impact on the young masses.”62 Students took advantage of these demands by the faculty and proposed that “classes in this course should be replaced by school meetings.”63 This went ahead, with either general meetings or smaller panels taking place almost every day between 17 October and 3 December. On 2 November, at one of these meetings, a petition was signed asking for the “transfer of the subjects taught at the Porto Sciences College to the School … access to the 3rd year without having passed three subjects and the utmost freedom for trainees.” On 16 November, this petition was personally handed to the Minister for National Education, who suggested that it should be discussed during a meeting at the ESBAP three days later. 33Students, teachers and the minister took part in this meeting at the Aula Magna in ESBAP. The students presented the same petition again, emphasising the need for functional autonomy and supporting their faculty in their claim for the lecturing body to be reviewed. The lecturers, in agreement with their students, reinforced the “three most relevant aspects – career, economic problems and research” and asked for “permanent experimentation” and financial support for the Architecture Study Centre. The minister, an expert in handling conflicts, made a speech about the role of the school in society, stating that “more important than teaching at school is the communal learning of the population” and about the importance of the school as part of the university, exalting the “true university” climate that was felt at ESBAP. He finished the meeting without making any commitments. 34For the rest of the academic year, faculty and students deliberated on the existing situation and prospects for the future. On the one hand, during the various general meetings, students produced further declarations with demands addressed to the minister and criticism of police repression at Porto University in March 1969. On the other hand, after countless meetings from May 1969 onwards, the faculty took a firm attitude and declared their non-availability to teach during the 1969-70 academic year. The comments of many of them are revealing: Fernando Távora felt “disenchantment”; Arnaldo Araújo “does not find a convincing or, at least, encouraging perspective to continue at the School”; Álvaro Siza, “considering it advantageous for some teachers to have a liberal profession, thinks that, under the present conditions, it is impossible to reconcile these two aspects, which for him are essential.” Octávio Lixa Filgueiras stated he was unwilling to continue, “so it is legitimate to claim to know the meaning of this collective, albeit unorganised, need to leave.”64 At the end of 1969 the ESBAP Architecture Course was closed down: “There are no teachers, there are no classes, there are no under-graduates”.65 Students directed a new petition to the minister requesting “functional autonomy,” and they informed the press about the breakdown of education at the School. 36The Architecture Course became the responsibility of a Coordinating Committee, consisting of three teachers and three students.67 The Committee reduced the number of subjects (which had prevented “the existence of a backbone”),68abolished the absentee system, and introduced a three-part study plan: A – Architecture, B – Mathematics, C – Parallel Subjects. Group A covered, under the heading “School of Architecture”, the areas of composition, building, structures and urban planning, and was a group exercise involving cooperation between faculty and students. 37The Experimental Regime ended on 29 July 1970. An evaluation report was written, and a future plan, entitled “Project for the basis of the re- organisation proposal for 1970-71,” laid the focus on developing a student’s personality and critical awareness, and developing autonomy and responsibility through teamwork, joint school management, and students’ control over their own education. Courses should have an identical structure from the 1st to the 6th year, with only four subjects: Drawing, Urban Planning, Building, and Theory. These were organised in “departments directed by architecture teachers, with expert assistance, gathering together some areas now scattered among different subjects.”69 Students would be grouped in curricular years and could also organise work groups with students from different years, to be evaluated by commissions of faculty and students. 38These changes represented a return to the basic study of architecture and, as the document claimed, to the tradition of the Architecture Course that existed prior to the 1957 reforms.70 In this way the School was no longer using a teaching model based on the French model (where in 1968 Architecture was taken out of the École des Beaux Arts), but aimed “to renew itself based on its own traditions.”71 The experimental regime remained in place until 1974, but it was undermined by the Ministry, which gradually shifted responsibility for School management back to the Director. Figure 3 Requiem for an Experiment, 1971-72. Archive of José Gigante. 39Students understood that the Experiment was dead, and ‘buried’ it with theatrical happening known as the “Requiem for an Experiment.” It became a lasting symbol of a democratic school, a “school for people” that inspired the creation of the Faculty of Architecture at Porto University after 1974. 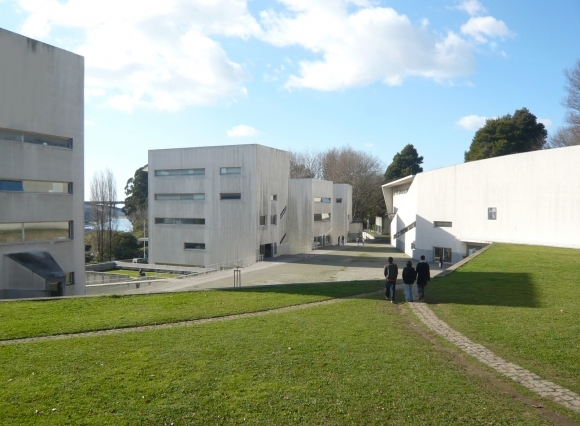 Figure 4 Faculty of Architecture at Porto University (1986-1992), designed by Álvaro Siza. 40With the coming of democracy in 1974 (and eventual membership of the European Union in 1986), the university system has gradually been opened up for the mass enrolment of students. State universities spread throughout Portugal with European funds, the polytechnic system developed technical education, and the private universities opened their classrooms to every student who was able to pay. 41Such rapid quantitative development brought many problems for the maintenance of qualitative standards in the education system, and the adaptations required by the Bologna Process (the EU’s directive to harmonise curricula and education methods in all universities by the end of 2010) are causing major difficulties. The Associação Académica de Coimbra is still protesting against “the destruction of State universities,” although the last major student struggle was in the 1990s against the payment of tuition fees. Today, in the government and in the opposition, we can find some of the activists from 1962 and 1969; the leader of the parliamentary group of the Socialist Party is the student who showed “lack of respect to President Tomás” in April 1969. 42The Porto Architecture School is now within the university system and is one of thirty Portuguese architecture schools; the current Director is the student who drew the oppositional cartoons in 1969. The School building, with a courtyard open to the city as a metaphor for the democratic process, is an icon of Portuguese architecture designed by Álvaro Siza, one of the leading teachers of the 1969 protests. 1 This paper is part of a PhD project entitled “The architectural education in Portugal”, supported by a FCT PhD Scholarship. 2 On 28 May 1926, a military coup suspended the Republican Constitution of 1911. In 1928, Salazar became Finance Minister under President General Óscar Carmona, and in 1933, as prime minister, he put forward a new constitution called the New State (Estado Novo). Democracy would only return with the 25 April 1974 revolution. The nature of these right-wing governments (1926-1974) has been discussed by scholars, who debate whether they were dictatorships, fascist or authoritarian regimes. See António Costa Pinto, Salazar's Dictatorship and European Fascism (New York: East European Monographs, 1996) and Dawn Linda Raby, Fascism and Resistance in Portugal 1941-74 (Manchester: Manchester University Press, 1988), translated into portuguese by Beatriz Oliveira, A Resistência Anti-Fascista em Portugal 1941-74 (Lisboa: Edições Salamendra, 1990). 3 The PIDE, the International and State Defence Police, was a secret police force centralized and specialized in information and political repression, under direct orders from Salazar. Between 1933 and 1945 it was called PVDE, State Defence and Surveillance Police, and after 1969 was renamed by Marcelo Caetano as PIDE/DGS, General Security Directorate. 4 Fernando Rosas, “O Estado Novo (1926-1974)” in História de Portugal, Vol. 7, ed. José Mattoso (Lisboa: Editorial Estampa, 1993-1994), 523. 6 Mário Soares founded the Socialist Party in 1973 and, after the “25th April”, became Prime Minister (1976-77, 1978, 1983-85) and President of the Portuguese Republic (1986-96). 7 Dawn Linda Raby, A Resistência Anti-Fascista em Portugal 1941-74, trans. Beatriz Oliveira (Lisboa: Edições Salamendra, 1990), 150. In 1962 Cunhal went to the Soviet Union and only returned in 1974. 11 Rosas, “O Estado Novo”, 547. 13 Costa Pinto, O Fim do Império Português, 31. 14 O Problema Universitário em Portugal (Lisboa: Editorial Vanguarda, 1934), quoted by Luis Reis Torgal in the Preface to Nuno Rosmaninho, O Poder da Arte. O Estado Novo e a Cidade Universitária de Coimbra (Coimbra: Imprensa da Universidade de Coimbra, 2006), 5. 15 José Cottinelli Telmo (1897-1948) was one of the most important modernist architects and film directors. In the 1940s he had been supportive of the nationalist ideals of the Estado Novo. 16 Celso Cruzeiro, Coimbra, 1969: a crise académica, o debate das ideias e a prática, ontem e hoje (Porto: Afrontamento, 1989), 46. 17 Álvaro Garrido, “A Universidade e o Estado Novo”, Revista Crítica de Ciências Sociais 81 (2008), 141 (especially the discussion about the idea of a fascist university). 18 Decree-Law no. 21,160 of 1 April 1932, art 2. 19 Decree-Law no. 39,660 of 20 May 1954, art 1 and 4. 20 Decree-Law no. 40,900 of 12 December 1956. 21 António Sérgio, Antologia Sociológica (Lisboa, 1957) quoted in Álvaro Garrido, “A Universidade e o Estado Novo”, 133-134. 23 On 25 November 1921, students occupied the Clube dos Lentes, the Professors’ Club, (called the Bastille by students) to establish the Academic Association. This day became the Storming of the Bastille and was celebrated as Student Day. 24 The Student Union of Coimbra was founded in 1887. The football section is the oldest in Portugal and has a professional team. 25 Miguel Cardina, A tradição da Contestação (Coimbra: Angelus Novus, 2007), 49. 26 Decree Law no. 44,632, 15 October 1962. Decree-Law no. 44,357 of 21 May 1962 had already given institutions the right to judge student discipline. 27 Garrido, “A Universidade e o Estado Novo”, 150. 28 Miguel Cardina, “Memórias incómodas e a rasura do tempo”, Revista Critica de Ciências Sociais 81 (2008), 127. “Capa e Batina” (academic dress) are important symbols for the academic rituals of Portuguese universities. 29 The reception of May 68 ideals in Portugal has been studied by Rui Bebiano, O Poder da Imaginação (Coimbra: Angelus Novus, 2003). 31 For example, António José Saraiva, Maio e a crise da civilização burguesa (Lisboa: Publicações Europa-América, 1970 [2nd edition Lisboa: Gradiva, 2005]). 32 See Miguel Cardina, A tradição da Contestação. 33 Planned by the architects Alberto Pessoa and Abel Manta between 1951 and 1961 and based on the ideas of Le Corbusier. 34 Jorge Figueira, “Para uma Coimbra não sentimental” in Ana Tostões, ed., Arquitectura Moderna Portuguesa 1920-1970 (Lisboa: MC/IPPAR, 2004), 62. 35 Cruzeiro, Coimbra, 1969, 102-103. The Pro-Association Commissions were elected bodies but had not yet been legalised by the ministry. 36 Alberto Martins is now a Socialist Party Member of Parliament. 37 Cruzeiro, Coimbra, 1969, 127-156. 38 “University closed in Portugal”, The Times, 8 May 1969, 9. 39 Raby, A Resistência Anti-Fascista em Portugal 1941-74, 265. 40 José Marques da Silva studied architecture at the École des Beaux-Arts de Paris between 1889-1896, and in 1932 as Dean of the Escola de Belas Artes do Porto he introduced the beaux-arts system as part of the reform of the architecture schools. 41 The school’s teachers, such as Fernando Távora and Octávio Lixa Filgueiras, worked with the Enquiry into Portuguese Popular Architecture between 1955 and 1960, published by the National Union of Architects in 1961. 42 Student teamwork by Camilo Cortesão, José Luis Carvalho Gomes et al., “Valongo, estudo para um plano”, Urban planning, ESBAP, 1971-72, archive of the Faculty of Architecture, Porto University. 43 English architecture was taught by Denys Lasdun in Porto (1963) and was reported on in Architectural Review. 44 The SAAL (Serviço Apoio Ambulatório Local) programme built low-cost housing with the participation of local inhabitants. See José António Bandeirinha, Processo SAAL e a Arquitectura no 25 de Abril de 1974 (Coimbra: Imprensa da Universidade, 2007). 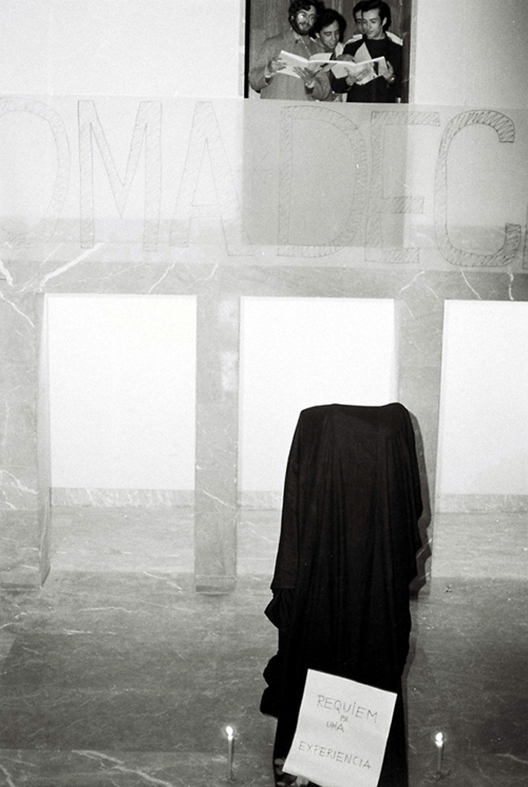 45 The Exposição Magna, Grand Exhibition, was one of dean Carlos Ramos’s ideas for connecting the architecture school more closely with society. Ramos was dean of ESBAP between 1952 and 1967. 46 Alexandre Alves Costa, “Tomada da Bastilha”, ESBAP 1, January 1962, 8. 47 Arnaldo Araújo, ESBAP 1, January 1962, 5. This was first published in Boletim da Antiga Associação de Estudantes da Escola de Belas-Artes do Porto (November 1954). 48 “Depois da Reforma. Depoimento dos alunos da ESBAL”, Arquitectura 72 (1961), 37-41. 49 Carlos Morais, “A crise do Jovem na Universidade”, ESBAP 1, January 1962, 12. 50 Comissão da Pró-Associação, Repport (9 December 1964), archive of Pedro Ramalho. 51 Mário Sacramento, “Sem juventude livre não há juventude responsável”, ESBAP 2, June 1968, 1. 52 ESBAP 2, “Informação sobre os movimentos internacionais estudantis”, June 1968, 4-5. 53 Alberto Friedman, Frederico Avanzini, “O que é que querem os estudantes? Como podem agir?”, ESBAP 2, June 1968, 4. Students occupied the Campagna Palace in Turin and implemented self-management at the Law School in Rome. 54 Carlos Araújo, interview, “Os acontecimentos estudantis franceses”, ESBAP 2, June 1968, 4-5. 55 Alberto Friedman, “O que é que querem os estudantes?”, 4. 56 “Debattito sulle scuole di Architettura in Italia”, Casabella Continuità 287 (May 1964). 57 Carlos Araújo, interview, 4. 60 Letter from the ESBAP School Council to the Minister for National Education (August 1968), archive of Pedro Ramalho. 61 The Minister for National Education allowed pedagogic experiments according to Decree-Law no. 47,587 of 10 March 1967. 62 Letter from the ESBAP School Council to the Minister for National Education (August 1968), archive of Pedro Ramalho. 63 Letter from the ESBAP Student Association to the Dean of ESBAP (4 November 1968), ibid. 64 Letter from Octávio Lixa Filgueiras to ESBAP Teachers (16 July 1969), ibid. 65 ESBAP Students, “A situação na Escola de Belas Artes”, 25 November 1969, ibid. 66 Diário de Notícias, “Professores e estudantes dirigem no Porto (em regime experimental) a Escola de Belas-Artes”, 18 April 1970, 1. 67 Professors Octávio Lixa Filgueiras, Fernando Távora, Jorge Gigante and students Ricardo Figueiredo, José Garrett, Rui Louro. 68 Letter from Coordinating Committee to the Minister for National Education (1 April 1970), archive of Alexandre Alves Costa. 69 Report from Coordinator Commission to Minister of National Education (25 July 1970), ibid. 71 Paulo Varela Gomes in Páginas Brancas (Porto: FAUP, 1991), 21. 72 Alexandre Alves Costa, “A Juventude Universitária e o Futuro” in Textos Datados (Coimbra: e|d|arq, 2007), 226. This is from a lecture given during the debate “A Juventude Universitária e o Futuro”, Porto, ESBAP, 1983.